GAEA50 is an exploration prospect appraisal system that translates an uncertain geological situation into an expectation curve of oil and gas volumes that may be found in a prospect. It might be called an "expert system" as it combines experience and judgement about petroleum systems with the data about a particular prospect. The basic idea is that an explorationist, or even a team, may not have sufficient knowledge to properly judge the various geological aspects, especially with regards to probabilities, let alone the various engineering aspects. Therefore a world-wide experience database assists to keep judgements within bounds. The program is mainly based on the articles by Nederlof (1979) and Sluyk & Nederlof (1984) describing the calibrated approach to appraisal, based on worldwide calibration. It is based on multivariate analysis of a learning set of well-known cases (analogons), both dry and hydrocarbon-bearing, while the application for prospect appraisal is mainly based upon bayesian logic. The present program, designed some ten years after that publication differs in some respect from the published approach. More input variables are included, and the model has been expanded, especially with regard to the timing of generation and entrapment. 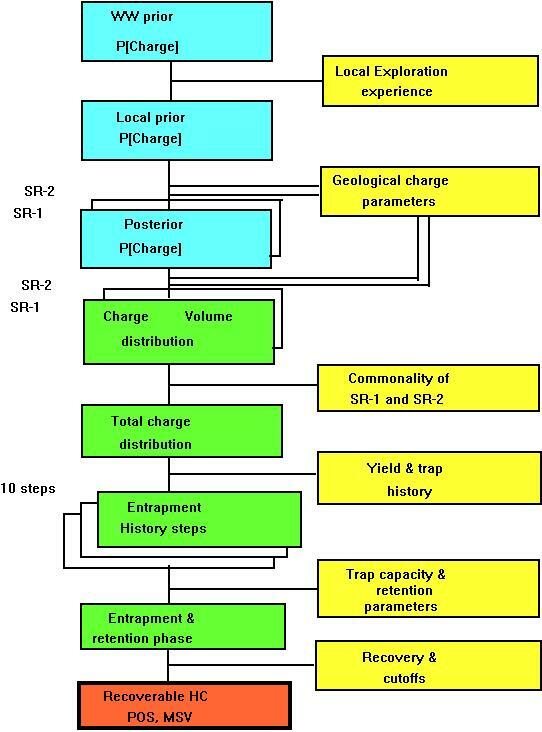 Where the Sluyk & Nederlof model was assuming entrapment of the total charge in the trap as it is found today, GAEA50 can model this process in up to ten time steps. This requires more input from the user, but leads to more realistic modeling of the hydrocarbon entrapment process. The program is written in Microsoft Visual Basic.net Express 2013 and for a Windows XP or higher platform. There is no version for other operating systems. The most complete option of the program is the Full Material Balance (FMB) approach for HC charge, as described by Sluyk & Nederlof. The flow diagram of this model is shown below. Some of the elements of this diagram are used in all appraisal options of Gaea50. The main phases in the modeling and the intermediate results are shown in the boxes on the left. The processes involved in estimating probability are colored blue, the volume estimations are in green. On the right are the inputs (yellow). Finally the box at the bottom (pink) shows the results which are probability distributions (expectation curves) of recoverable reserves and the summary statistics derived from these. Other options work instead with a user estimate of the HC column, or with the estimated position of HC contacts. In the case of FMB, the calibration required on a worldwide basis is not completely available from the publication. Some constants in the program had to be approximated and associated with a rather high degree of uncertainty. The calibration parameters are stored in the GaeaCal.mdb database which comes with the Gaea50 program. Gaea has carried out a number of new calibrations the results of which are incorporated in this program. The user may modify such "defaults", for instance by making his own calibration. The results of such statistical analysis can be used to update the constants in the program in a statistically acceptable way. A useful aspect of Gaea50 is a fairly sophisticated modeling of the trap capacity. An objective formation can be described as a single pool reservoir which has a single set of parameters, such as gross thickness, net-to-gross, porosity, water saturation. It is also possible to describe a set of "typical" or identical reservoirs, each with its own top seal. The number of such stacked reservoirs is described as an uncertain number as a distribution. In such case the total interval thickness comprising the set of reservoir/seal pairs must be given. Another option is the "layered reservoir". Up to five layers can be described with thei own parameters. A layered reservoir has communication between the layers. This is a useful description mechanism if a waste zone at the top of the layered reservoir is present or inferred. A waste zone is neither seal nor reservoir and may have a zero recovery efficiency. In the worst case, all the hydrocarbon charge may fill the waste zone, but nothing is left for the deeper proper reservoir. Trap geometry description options are contoured structural trap and contoured stratigraphic trap. In the structural trap, only the contours at top reservoir are required. The base reservoir is obtained by vertical translation downward over the gross thickness. For parallel folding, common in more pronounced folding, the vertical translation would be incorrect. In that case a special algorithm calculates the position of the base reservoir. Stratigraphic traps require two sets of contours as input: top and base reservoir. In that case the gross thickness of the reservoir is not an input, but calculated as the depth difference between top and bottom. In addition there are a number of simple geometric shapes that can be used if contours are unavailable, such as cylindrical, spherical, cosine, etc. 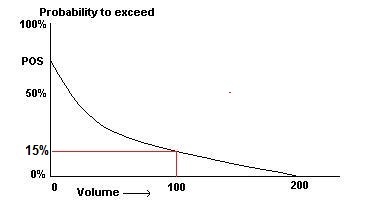 All the various trap description options result in a depth/Bulk Reservoir Volume graph, used in the entrapment phase of the simulation. The oil water contact in each Monte Carlo cycle is dependent on the reservoir parameters of that cycle. For instance, a high porosity estimate results in a shallower OWC than a low porosity, etc. GAEAPAS comes with a set of programs under the name of GAEATOOLS that facilitate some of the preparatory work for prospect appraisal, calibration, prospect ranking, checking back on past performance, or hydrocarbon province analysis. It appears that the particular statistical approach used here is still rather new to the Industry, or at least not widely adopted. This is not surprising, as usually a wealth of data are required for the calibration exercise. However, the set of calibration programs provided in GAEATOOLS and the methodology to use even a limited set of calibration data to one's advantage as developed here, should enable many small and medium-sized companies to appraise their prospects with confidence. The output of Gaeapas is particularly suited to assist economic evaluation of exploration opportunities. Not only the estimates of amounts of recoverable oil and gas are important, but also the statistics on HC columns and productive areas can be used in the estimation of development costs. One of the aims of systematic exploration prospect appraisal is to limit the weight of subjective judgments in the result. GAEA50 ( and its older version "Gaeapas") is probably the system that makes the most serious effort to do this. A selection of input and output screens of the program gives an impression of the possibilities and flexibility of the Gaea50 program.